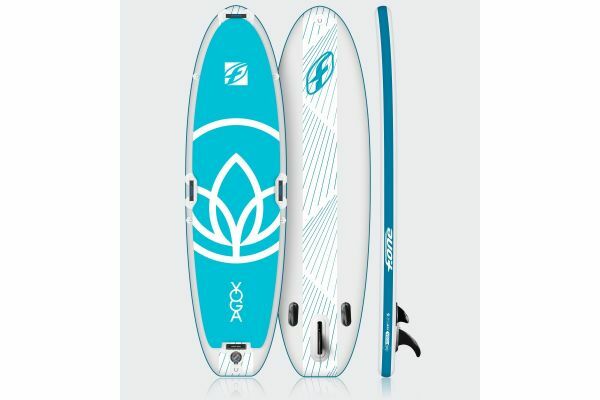 Ideal for just enjoy and fully practicing Stand up Paddle, inflatable boards MATIRA offer you the versatility and performance you need. The range of inflatable Stand Up Paddle MATIRA 2016 has 12 models to offer a product that fits your practice, your size and your level, and in order to obtain maximum enjoyment on the water. When folded in their bag, they carry very easily and does not take up space for storage. All shapes have nominated summers to make these boards performing in their class either surfing (fluidity of outline curves, optimized scoop), race and touring (rocker optimized for inflatable technology thickness ratio / ideal width for comfort, speed and stability) and the ride (stability, comfort, accessibility and versatility). We have chosen to offer two technologies: The MATIRA LIGHTWEIGHT SERIES are lighter and therefore allow you to carry your SUP even easier. They will also be more manageable in the waves and faster on the water. Their lightweight facilitates the acceleration to the train, so they are advised to lighter jigs. The MATIRA superstiff SERIES receive more reinforcement layer that LIGHT WEIGHT SERIES, it makes them stiffer and more resistant to shocks. Hosszúság / Szélesség: 10'8"" x 34"""
Kapcsolódó linkek "Matira Yoga SUP deszka 10'8"x34"x6" 345L Ligth weight"
Vásárlói értékelés "Matira Yoga SUP deszka 10'8"x34"x6" 345L Ligth weight"